Judy Garland has been, for many people, the most compelling performer in cinema history. A stunningly gifted singer and actor, Garland won viewers over with her intense sincerity and charm. A tumultuous private life only seemed to add lustre to her performances and colored how audiences perceived them. She was born to ex-vaudevillians who had settled in Grand Rapids, Minnesota, to run a movie theatre which featured stage acts. At two-and-a-half years-old, Frances and her older sisters Mary Jane and Dorothy, sang "Jingle Bells" for the Christmas show, with mother Ethel playing piano. The Gumm Sisters had launched their careers. Father Frank relocated the family to operate the Valley Theatre in Lancaster, California in 1926. Ethel began grooming her daughters for showbiz by having them attend Hollywood High. By 1928, the Gumm Sisters had become involved with the Meglin Kiddies, where they appeared in several early talking picture shorts. In the meantime, The Gumm Sisters toured the vaudeville circuit,which included film houses. Amazingly, the Gumm Sisters actually played in the stage show accompaning The Count of Monte Cristo in November, 1934. Variety's reviewer remark of Francis' singing: "Possessing a voice that, without p.a. system, is audible throughout a house as large as the Chinese, she handles ballads like a veteran, and gets every note and word over with a personality that hits audiences." A bill shared with George Jessel resulted in the act changing their name to The Garland Sisters. The act broke up in August, 1935 when Mary Jane eloped to Nevada. 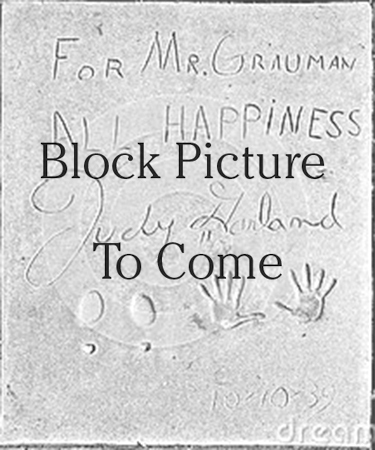 Judy Garland appeared onstage at the Los Angeles Orpheum Theatre, where she was spotted by a Metro-Goldwyn-Mayer talent scout; she made a test, sang for Louis B. Mayer, then was signed up at the age of thirteen. Garland co-starred with singer Deanna Durbin in the charming short Every Sunday (released in November, 1936), which brought out her "girl-next-door" qualities. She was paired with Mickey Rooney for the film Thoroughbreds Don't Cry (which played the Chinese in December, 1937). The pairing proved to be so popular, she became the girl living next door to Rooney in his Love Finds Andy Hardy (which played the Chinese in July, 1938). Garland would achieve lasting immortality with her next film, The Wizard of Oz (which had its west coast premeire at the Chinese in August, 1939). Adored the world over and considered the high-water mark of Hollywood's Golden Age, Garland took over the film from the very start with her touching redition of the song "Over the Rainbow," which became not only her signature song, but an enduring theme for millions everywhere. 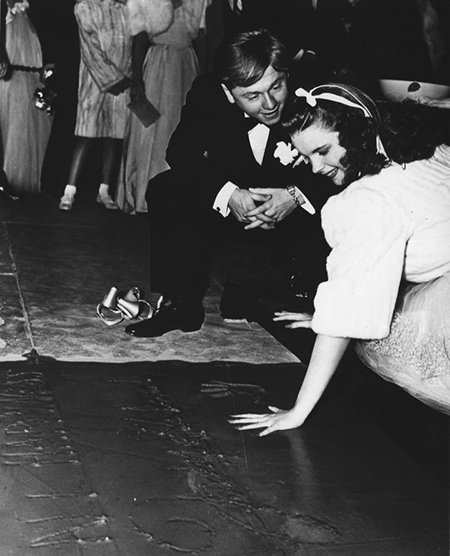 After Oz, Garland became M-G-M's greatest female musical star, with most of her films becoming whopping hits: Babes in Arms (Garland was given a Forecourt ceremony during the film's premiere at the Chinese in October, 1939), Andy Hardy Meets Debutante (which played the Chinese in July, 1940), Strike Up the Band (played the Chinese in September, 1940), Ziegfeld Girl (played in April, 1941), Life Begins for Andy Hardy (played in August, 1941), and Babes on Broadway (played in January, 1942). Judy Garland made the trasition to young adult roles, starring in the classic Meet Me in St. Louis (released in January, 1944), and The Clock (released in May, 1945). Her hit musicals continued unabated until 1950: The Harvey Girls (released in January, 1946), Till the Clouds Roll By (released in December, 1946), The Pirate (released in June, 1948), Easter Parade (released in July, 1948), In the Good Old Summertime (released in July, 1949) and Summer Stock (released in August, 1950). The result of all of this work left Garland traumatized and depressed. She had been hospitalized several times and had attempted suicide as well as being unreliable about showing up for work. M-G-M let her go. She made an appearance on The Bing Crosby — Chesterfield Show, where she was terrified to go on, but Bing Crosby made her such a kindly introduction, that she performed on the radio program flawlessly. She went on to appear on the show several times more. A concert tour of Europe followed, which was a great success for the singer. Garland enjoyed a standout engagement at the Palladium Theatre in London, England, as well as the Palace in New York City, for which she received a special Tony Award. With husband Sid Luft producing, Garland filmed a musical remake of A Star Is Born for Warner Bros. (released in October, 1954). The expensive film was heavily cut by the studio, and although many consider it a classic, it remains in its trucated form something of an acquired taste, and did not pul Garland back in Hollywoodland in any major way. Galand dabbled with television programs, beginning with the Ford Star Jubilee on CBS in 1955. Unhappily, Garland, Luft and CBS became entangled in legal disputes. She appeared at the Frontier Hotel in Las Vegas in 1956. She returned to New York's Palace Theatre in late 1956. By late 1959, Garland was in the hospital with hepatitis. She was told that she might never sing again. Perversely, she felt relieved at the news, and went on to return to the Palladium; she also recorded some of her concerts at Carnagie Hall, recordings which earned Garland a Grammy Award in 1961. Garland made a very disturbing portrayal in the film Judgement at Nuremberg (released in December, 1961), sang some songs for the animated feature Gay Purr-ee (released in October, 1963), and filmed A Child is Waiting with Burt Lancaster (released in January, 1963. 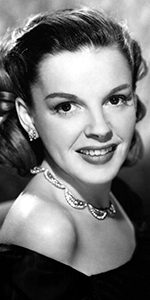 A re-approachment with CBS in 1961 brought about some specials called The Judy Garland Show. The first with Frank Sinatra and Dean Martin, aired in 1962. Two more specials followed, then The Judy Garland Show went weekly in the Fall of 1963. It was cancelled after only 24 episodes. By this time, Garland was in deep trouble with the IRS, so she made her final film in England: I Could Go On Singing (which played the Chinese in April, 1963), after which she threatened to live in England permanently. She returned to the London Palladium Theatre in 1964, with daughter Liza Minelli in tow, and appeared on The Ed Sullivan Show and The Tonight Show. A Tour of Australia was a mixed affair. In July, 1967, she returned to The Palace, New York. While in London, Garland did a stint at the Talk of the Town nightclub for five weeks. Somewhat later in June, she was found dead from an accidental overdose of Seconal in her London flat. She was only 47.